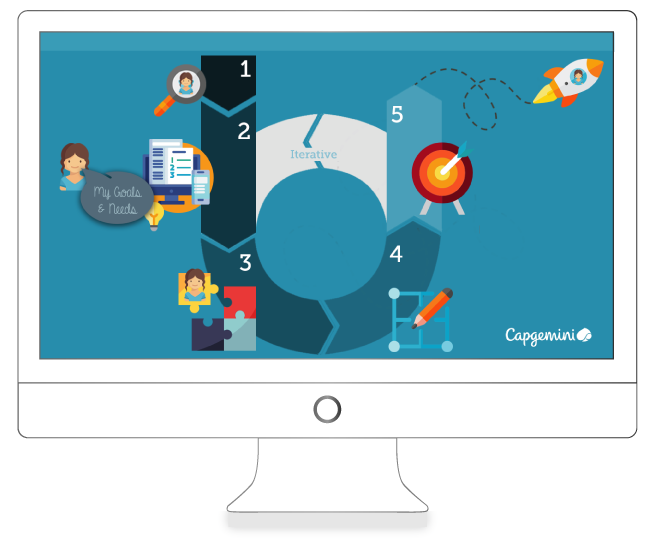 I took two leaderships activities as UX strategist at Capgemini besides the projects and sales activities. First was the implementation and localisation of Rapid Design & Visualisation (RDV). Starting point was understanding the method and taking in material that was created by colleagues in other parts of the world. My task was to see what was relevant for the (mainly) Dutch market and to make a Dutch story around RDV, to set-up and organise trainings and to implement it in the Dutch organisation. RDV was seen as differentiator from competitors and as a framework for CX/UX assignments. Second activity was the coaching of consultants. Main reason for this was to create a save setting to help the co-workers in their development. Something that was difficult to create when there was a conversation between line manager and co-worker. About 8 consultants liked this and together we took time to bring them further in their (mainly) professional live.